This isn’t an exciting vehicle, it’s a truck. 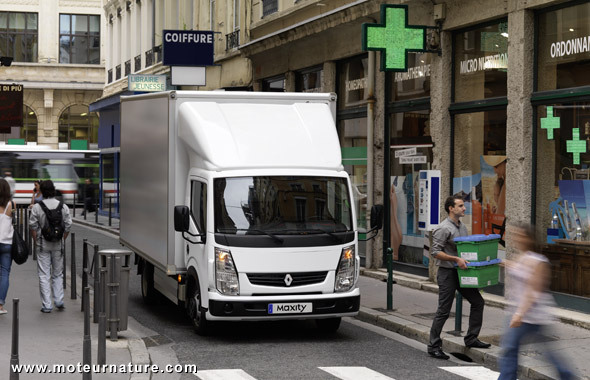 With a 47-kW motor, I guess it’s a very slow one, so slow that it couldn’t drive on an highway, but it can be useful for inner-city deliveries. That’s the job of Greenway Services, a relatively new company, it works in Paris, delivering small goods without emitting any CO2 emission. It already has a fleet of smaller vehicles, those Maxity trucks will enable it to deliver larger goods. But I’m still waiting for the electric Renault Maxity to be available on a normal commercial basis. Greenway Services will rent those 10 electric Maxity on a 4-year contract whose terms haven’t been disclosed. Renault says the electric Maxity is available for rent anywhere in France, I hope it’ll be on sale next year at the latest.